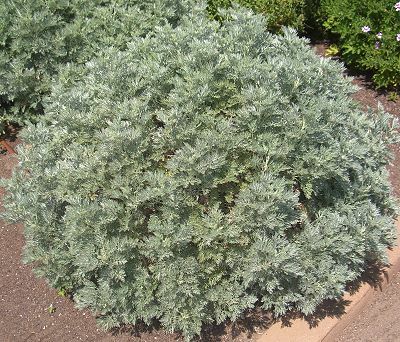 Like other Artemisias, Powis Castle Artemisia is highly fragrant and very drought tolerant. 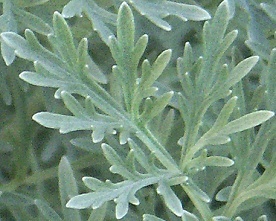 However it is different from both its parents, Wormwood and Tree Wormwood, because it is a very light bloomer. 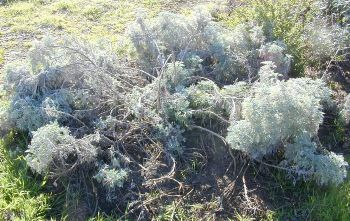 Artemisia flowers are not only underwhelming but they also tend to get tall and cause the plant to fall apart. The best way to prune Powis Castle is for looks. In autumn or spring, prune for shape. It is not necessary to prune for the health of the plant. 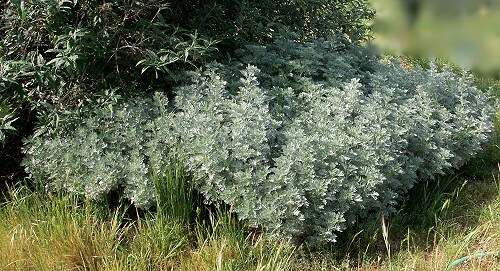 If left unpruned, Powis Castle Artemisia will naturalize and spread 20 feet or more. This rather large Powis Castle was damaged in a snow storm. Flattened by the weight of the snow, most of the two-to three-foot arms were forced to splay out in all directions. As you can see below, It looked much better after it was cut back and given fresh mulch. Not only is Powis Castle beautiful to look at and easy to care for, it also has a wonderful fresh scent. These soft ferny leaves make an aromatic bouquet ideally suited for crafting fresh herbal wreaths or drying for potpourri. The elongated stems are particularly suited for filling the bases of wreath forms. Like all Artemisias, Powis Castle can adapt to most soils and sun levels. This plant is sometimes available in plug trays. These trays hold 128 of all the same plant. They are a great low cost way to fill a lot of space. Each cell is 3/4 of inch by an inch. Check here to see if Powis Castle Artemisia Plug Trays are available. Powis Castle Artemisia is one of six plants chosen for our Zone 8-11 Crafter's Herb Garden Six Pack and for our Zone 8-11 Fragrant Herb Garden Six Pack.